Ah, but an hour later comes the stomach rumble, so next is investigate food options. 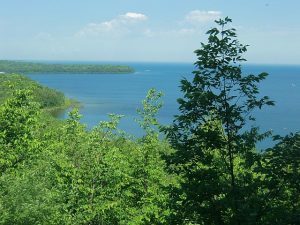 Do ask your accommodation manager because Door County is loaded with good restaurants and diners so choosing one is a matter of what kind of food you’re in the mood for and how far you want to go. 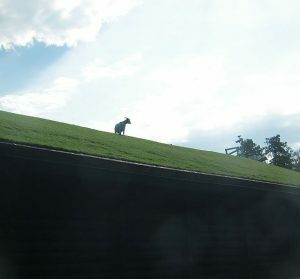 Eat at Al Johnson’s or park there to see the goats on top of the restaurant. For lunch consider Chef’s Hat Café for one of their yummy soup and salad combos and Nanaimo Bar desserts or Wilson’s for their great cheeseburgers, home-made root beer and ice cream sundae. They’re both in picturesque, historic Ephraim across from Eagle Harbor. Walk off dinner by exploring the village’s shops and museums. When ready for dinner, you can go back to Ephraim to experience the fish boil at the Old Post Office. Or go to The Cookery in Fish Creek for fabulous chowder, really good pork chops or fish and apple crisp for dessert. Or dine upscale in Sister Bay at the Boathouse on a lobster mac and cheese or shrimp and oysters,with a great view of the bay or at Lure in a former church that has delicious cheddar biscuits, crab cakes and coconut beer battered shrimp. For bistro, pasta dishes or creative beers on tap, stop at Egg Harbor’s Liberty Square. The next morning start the day with yummy cherry filled French toast at Fish Creek’s White Gull Inn or with Swedish pancakes at Al Johnson’s in Sister Bay. Both establishments have been Door County landmarks for years. 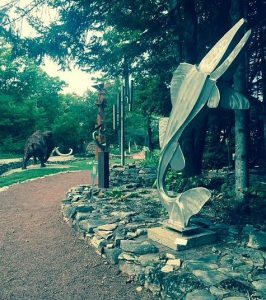 A must gallery stop is Edgewood Orchard in Fish Creek to do its sculpture walk. No matter how long you stay, you likely won’t get to all the great eating places on The Door or to all its activities. Where to eat merely is one challenge of Door County vacationers. Choosing which state park to hike or bike, which golf course to play, which boating activity to do, which winery or cheese market to visit and how many art galleries to see for that special piece of pottery to take home, can be bewildering unless you realize you have to return to The Door. Tip: Try another season. If there in the summer, plan to come back in the fall when the colors are spectacular.